Anniversaries are often touchstones to where a person or an entity has been and how a life or an organization has lived or thrived. This is why if you are planning to host an anniversary party or celebration, paying attention to the tiniest details will help you and your guests enjoy the celebration even more. In this article, we provide tips and guidelines how you can create your own 50th-wedding-anniversary invitation cards and how you can use anniversary invitation card templates to make them. 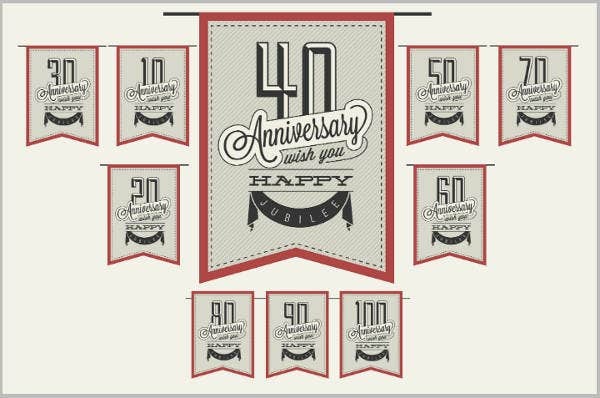 This article is also filled with multiple downloadable examples or printable anniversary invitation sample templates that can be used to commemorate the 50th year of a couple or an organization. 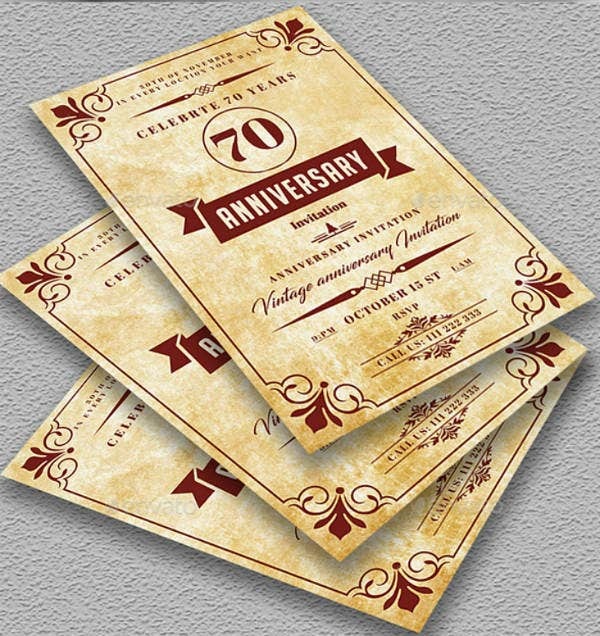 As we have promised, embedded below are the printable 50th-anniversary invitation sample card templates that anyone or any organization may use for the anniversary parties. All these pre-made templates are available either as Adobe Photoshop or Illustrator template files so make sure that you have a compatible graphic design software tool installed before you download and purchase the invitation card template of your choice. What is an Anniversary Invitation? An anniversary is a yearly rite or observance of an event. The most common types of anniversaries are wedding anniversaries or the yearly commemoration of a couple’s union and the yearly founding anniversaries of established companies and organizations. Anniversaries may also be held as a ceremonial rite to remember the birth, death, or discovery of a person or thing. And when formal events or parties are held in concurrence with these anniversary ceremonies or celebrations, an anniversary invitation card is usually used when inviting guests. Anniversary invitations work just like any regular invitation card. They contain information about the celebration like the type of event, dress code, place and time, RSVP options, and other information pertinent to the party or celebration. Anniversary invitation cards also come in different shapes and sizes. They can be created using pre-made templates, by hand, by using electronic invitations, or by ready-made printable ones sold in stationery stores. If you are planning an anniversary party for yourself, a family member, or an organization, you will need to decide on what kind of invitation card-making method you will use for your own invitation cards. 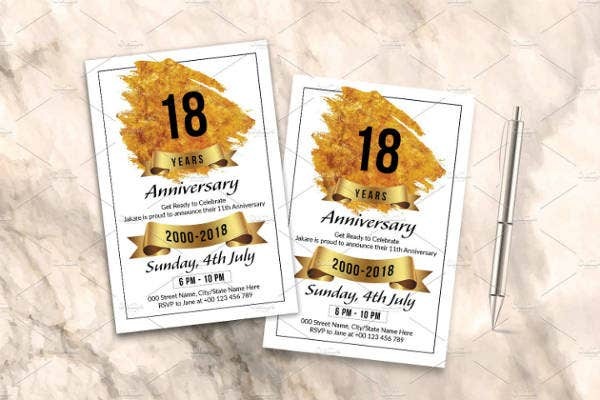 If you are interested in following the pre-made template invitation card-making route, feel free to browse and choose any of the anniversary invitation card template designs that we have curated in this article. In this article, we mainly feature 50th wedding anniversary templates that can help glam up any anniversary event that you are planning. But before you could have the best anniversary card, it is better to choose a pre-made printable template that specifically addresses all your needs and personal preferences. 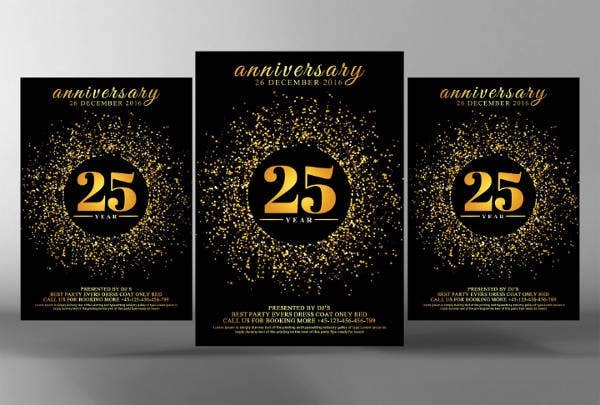 And to achieve this, we have listed the top five factors that will help event organizers and party planners choose the best anniversary card template design for their respective events. Read each criterion closely so that you can apply them in your decision-making process. The type and theme of your event are one of the most important factors to consider when creating any kind of anniversary card. To illustrate, if you are planning a wedding anniversary party that follows the same floral wedding theme as your wedding ceremony fifty years ago, it also makes sense to use the same event and invitation stationery design theme for your latest anniversary. By following a specific theme for your anniversary party event, you are helping create a unifying characteristic of the entire event. Doing so will also help bring together the event, its guests, and other design elements and help create the illusion of cooperation and harmony – things essential for an anniversary event. There are different ways to achieve cohesion in any anniversary event and using complementary designs in your invitation cards and venue decoration is only the beginning. If you are the event planner, you will gradually see all the possibilities the more you plan out the event. The next factor to consider when choosing a 50th-anniversary invitation template is the amount of money that you intend to spend for the entire anniversary party or celebration. This is another important factor to consider especially for those who need to follow a budget plan or those who just do not want to spend a lot of money for invitation cards. Also, remember that one’s party planning budget does not only cover the cost of buying pre-made 50th-anniversary invitation card templates. The budget for a party or event also needs to be spread out for other expenses like the printing of each anniversary invitation card, the food or catering for the event, the party venue rental, the sound equipment rental, the decoration expenses, and even the cost of gifts (this applies to those who are planning an anniversary party for another people or those who want to give anniversary gifts to all their employees). As the main event organizer, you need to carefully think through all these things and make sure that the anniversary invitation template you choose will match your budget, your intended printing format, and all the other aspects of your anniversary celebration. When selecting a pre-made 50th-anniversary invitation card template, you should also factor in your own graphic design or editing skills. This is important because you need to make sure that you can edit the anniversary card template that you wish to purchase and download. Sure, there are printable wedding anniversary invitation card templates that can be edited by the template’s original creator. However, choosing this option may cost you more and/or you will not be able to make personal edits on the template itself. When you assess your own graphic design skills first, you can spend more time practicing how to edit by studying different Illustrator and Photoshop tutorials first. You can then proceed to edit the real 50th-anniversary invitation card template once you are more confident in your graphic design skills. The beauty of using pre-made card design templates is that you are free to proceed at your own pace. Or, if you are in a hurry, you may always follow the step which we have recommended earlier which is to have the template’s original creator edit the template for you or to altogether just delegate the editing task to another person. But before any changes can be made to the original anniversary invitation card template, you need to make sure that the invitation card template you have chosen is fully customizable. If a card template is not fully customizable, you will have very limited options in terms of personalizing the entire invitation card template. This is the reason why you should always check if an invitation card template has fully customizable layers and graphic design elements. As a tip, Adobe Illustrator and Adobe Photoshop templates often offer the most flexibility in terms of editing its base template. 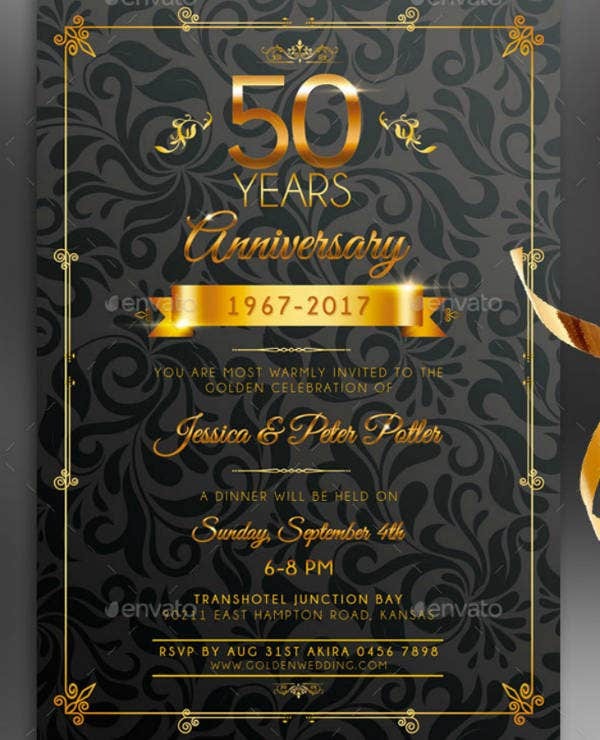 Another important factor to consider prior to choosing and purchasing any 50th-anniversary invitation template is the kind of graphic design software program you have installed on your computer. This is an essential factor to consider because most invitation card template files may only be opened and edited using a compatible graphic design software. For instance, if you have Adobe InDesign installed on your computer, you should always choose a pre-made printable template that is available as an InDesign template download file. This ensures that you will be able to open and edit the template using all the functionalities and features that Adobe InDesign offers. Some template download files like those available in JPEG, PDF, or DOC formats may be opened using other software programs. However, the number of edits you can make on the template will be very limited. So, if you are looking for ways to truly transform and personal touches to your 50th wedding anniversary invitation cards like add your own wedding monogram or incorporate the same vintage wedding template themes used in your first wedding, it is best to make sure that you have a compatible graphic design software program installed on your computer that can correctly open and edit the invitation card template of your choice. Choosing a 50th-anniversary invitation card template design can both be confusing and tiring if you do not give yourself a set of rules to following during your decision-making process. To avoid this, always remember to follow the different anniversary invitation card selection tips that we have shared above so that you will have an easier and more relaxed time planning for your anniversary event. And if you wish to plan more anniversary parties or events for your friends and colleagues, you can always refer back to this short guide and make use of any of the pre-made invitation card templates that we have featured in this article. Also, you can help other’s lives easier by sharing this article with your friends and followers on social media and on your email list.